It seems like just the other day that I traveled to Thailand in search of Dodge Power Wagons. Over 2 years ago I was fortunate to find a large cache of Military Dodge M601 open cab Power Wagons and M615 ambulances. These trucks were based on the famous WM300 Dodge Power Wagon design with the substitution of an open cab body in place of the traditional closed cab. I traveled to Thailand with my friend Art, who had come along for the journey to give me a hand with a project that had seemed nearly impossible. My goal was to bring back to Iowa, over 75 Dodge Power Wagons. It was to be a difficult undertaking to say the least. On the flight over, we began to organize our thoughts. We set some goals of what we would like to accomplish and in what time frame. I had seen the trucks on an earlier trip just a few days before 9/11. I had been relieved to find out that I was not the high bidder after the World Trade Center had been destroyed right after my return to the U.S. Some months later, when things began to calm down, I made contact with the high bidder and asked if I could select up to 80 vehicles for transport back to the U.S. I had contacted the owner who spoke only Thai and left a message. A return call from a friendly voice that spoke very clear English helped establish a relationship with the winning bidder of the Dodges. The translator’s name was Surin. We began to communicate frequently thru e-mail over the coming months about what it would take to not only make the purchase, but to disassemble, load and transport a large number of Power Wagons back to the U.S.
By the time we arrived at the hotel in Thailand, it was 2 AM and Surin was waiting at the desk for us. I was impressed by the fact he would go out of his way to meet us in the middle of the night, but more than anything I was impressed by his kindness & friendliness. It was to be the start of a long friendship. The following day, after hours of travel, we arrived at the new location of where the trucks had been moved to from the earlier auction site. It was beautiful and a bit overwhelming, with over 250 Dodges, packed like sardines, in a rough paved parking lot. If you’ve never seen that many Dodges parked together, I can only describe it as a dream like state where you rub your eyes in disbelief and wonder if you will wake up soon from this unbelievable dream you are having. The delivery truck arrived the following day with our (12) Thai mechanics and a load of wood ammunition crates for parts, two of which were loaded with some of the sorriest looking tools I had ever laid eyes on. The worn out, broken wrenches & sockets had been simply dumped into the boxes. The 2 ton flatbed truck was towing a small Toyota pickup that looked like it had been through a war. Not one spot on the truck was free of dents and upon examination, I found the engine was not running and had locked up after 400,000 miles of hard, hard use. In the back of the Toyota was an old but very heavy gasoline powered compressor. The worn out pickup had simply become the wheels for the compressor and had to be towed whenever the compressor was to be moved. A large older acetylene torch set lay in the rear of the pickup bed. Many trips to the local hardware store, along with thousands of dollars worth of tool purchases, remedied the situation. Surin called a “classroom” meeting that morning and became the go-between our workers, who spoke only Thai, while Art and I spoke no Thai. I conveyed step by step how we would go about disassembling the trucks, where and how we would organize our parts, tools, crating and containers. From that point on our workers knew what “classroom” meant and it soon became a daily habit. After cleaning out two old farm structures with partial tin roofs, we set up our “chop shop” assembly line. Within a week, our motley looking team began to improve on skills. They were proud at the end of the day having fully disassembled (2) entire Power Wagons. Our driver Jod spoke a little English and was able to help with the translation as well. I made contact with Surin daily by cell phone and he explained to the workers what I wanted. His translation work was invaluable with not only our workers but in gathering the necessary nightmarish paperwork involved in the purchase. While I never mastered speaking Thai, I did pick up what was necessary, the names of parts & tools and most importantly “mai dee”, which means “no good”. When someone wasn’t doing what I wanted, a simple “mai dee” and the worked stop. After nearly two months of back breaking work, the components from over (60) vehicles, along with 20 complete trucks, were carefully loaded into (13) 40’ ocean containers. The long journey to Iowa had begun. Before leaving our workers, I bought them each a pair of good boots as most had been barefoot or wore only slip-on thongs for footware. Near the end of the project, I had returned to Surin’s hometown of Nakonpathom to pay a final visit to him in his computer repair shop. The walls of his small facility were literally covered with offroad shots and wildlife photographs, showing unique animals and plants of every kind. These amazing photographs sparked my interest and so I asked him about them. As a young man, he had traveled to a special place in the northern part of Thailand. 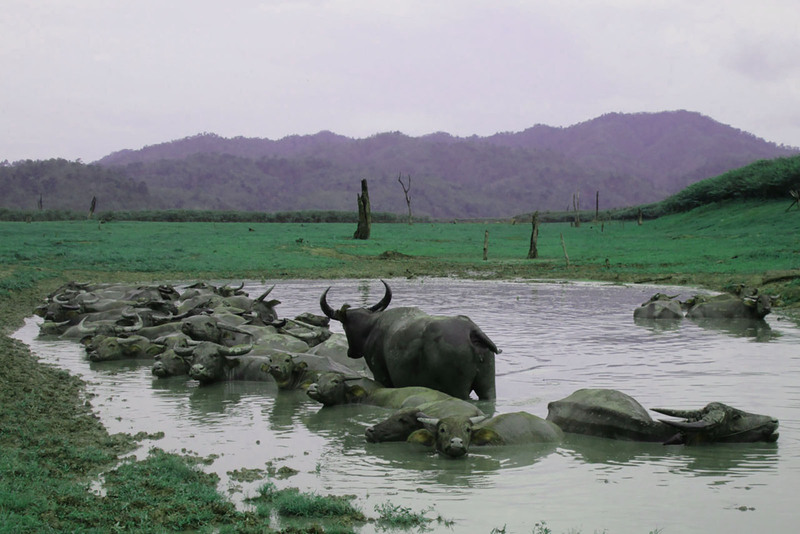 Thungyai Naresuan Wildlife Sanctuary, a Natural World Heritage Site, is located on the western international border of Burma and is part of the Western Forest Complex. 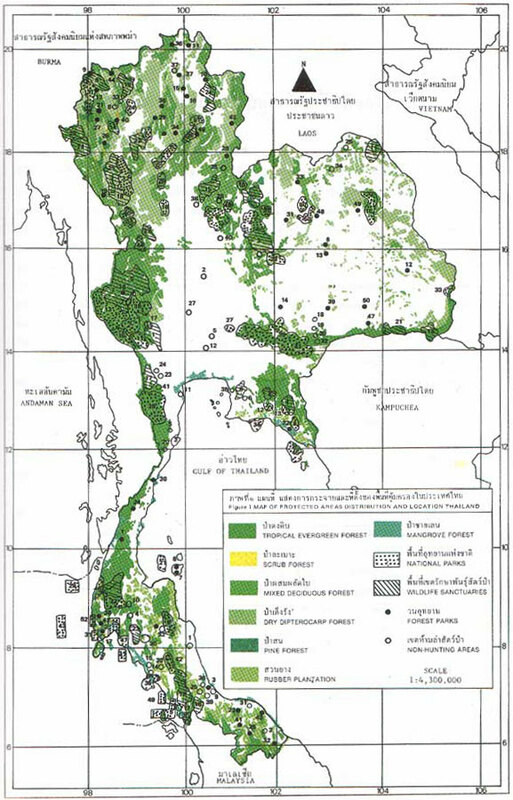 One of last great remaining forests in all of Southeast Asia, it covers nearly 4.4 million acres and supplies over ½ of the oxygen in Thailand. As Surin watched, civilization was drawing dangerously near Thungyai, as millions of acres of pristine jungle near the boundaries of Thungyai were being decimated year after year. Poachers were taking tremendous tolls on wildlife populations within the sanctuary. It was hard to understand why this pristine forest wasn’t getting the protection it desperately needed, but funding wasn’t available. It was obvious that Thungyai (meaning “big field”) needed help. Surin’s love for this great forest soon became his lifetime obsession. It became his mission to protect not only all the wildlife in the forest, but a small group of tribal people, who had lived for hundreds of years, deep within the forest. While I was certainly passionate about Dodge Power Wagons, my interest was dwarfed in comparison by Surin’s total dedication and focus on Thungyai. It was time for me to pay Surin for the many hours of translation and support services he had provided me with over the last few months. He refused my offer and would not accept payment. I argued with him, but it was no use, he had made up his mind. “Alright then, if I can’t pay you, then let me make a donation to your conservation club”, I argued back. This he would most graciously accept and I was pleased. My donation to the Western Forest Conservation Club (WFCC) was small by U.S. standards, but the excitement in his eyes along with his big smile made me know how much it was appreciated. I was excited and without a moment’s hesitation, I accepted his offer. Two days later at midnight, we gathered outside Surin’s office and began to load needed equipment and supplies. Our transportation was a red Toyata pickup truck which had logged over 500,000 thousand miles during its rough life. The truck was on loan from someone. Food, sleeping gear, minimal clothing, pipe, rolls of wire and radio antennae sections filled the truck to the brim. Lengths of pipe and antennae sections extending well over the top of the cab were secured. We were accompanied by two other WFCC members. Nok, a longtime friend of Surin and Ko, the youngest member of the Western Forest Conservation Club. Both would be helping us out over the next week. Surin and Nok chose the back of the truck to catch some much needed sleep before daybreak. Ko drove the 8 hour journey to the jungle entrance, while I rode shotgun. The red Toyota or “Truck with the Iron Heart” as WFCC members called it was loaded to the hilt and I was concerned. That morning after dropping off donated school supplies at a local village orphanage, we arrived at the back entrance to Thungyai wildlife sanctuary and forded a low river crossing. 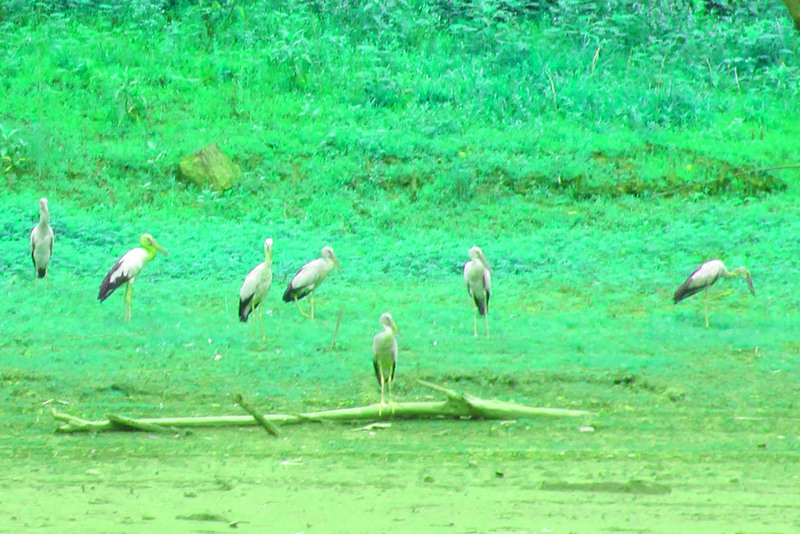 It was the dry season and the water level was low. Overhead was a high suspension bridge nearly 40’ above the water crossing. Surin explained that during the rainy season the river rises and floods even sometimes covering the bridge. Travel to and from the outside is impossible during those times. Within 100 yards of the entrance we stopped at the first ranger station. While I can’t speak or understand Thai, it’s obvious to me that these rangers are very excited to see my traveling companions. An unexpected problem with radio equipment at the station delays our journey for several hours as WFCC members set out to repair the situation and spend time talking with the rangers who see very little of the outside world. Surin points out on the map our route of travel, over 300 kilometers of very difficult, varying terrain. Our trip will take us to the north and then back around in nearly a full circle. It will take us one week. Several miles into the trip a clunking noise has us stopped only to find part of the front steering links have come loose. With some of the radio wire on board, I wire it back in place the best I can and move on. I am hoping that the wire will hold for the entire trip, but I secretly wonder. An elephant is on the road ahead, wild I think at first, but his rope collar gives a clue that his owner is nearby. The Thai people have huge admiration and respect for elephants. 10 years ago Thungyai Rangers found a herd of 7 elephants, slaughtered for tusks by poachers, their carcasses rotting by the stream in the deep jungle. It is clearly painful for Surin to even speak of the incident. Many times during our trip we make river crossings and after traveling most of the day we park near one and go for a swim, the water is crystal clear and a relief from the dust and heat. We stop and deliver school supplies and food to a small village where WFCC has supplied construction materials to built a small one room school. The teacher is grateful to receive the items. She works at this remote village for no paid at all and is dedicated to helping the local children learn. The village is so remote that five years earlier these villagers did not know that they even lived in Thailand. The first teacher died of Malaria , the second teacher went to tiger’s dinner , the third died in car accident when he went out the forest to visit his family and the last one disappeared , never returned after he went back to see his wife 3 years ago. It is not an easy life. After dark we arrive at the Koe Sadoeng wildlife protection station. A small concrete block building is where we will sleep. The following morning everyone is up early and I glance outside. The station is located in a narrow valley surrounded by steep hillside forests. Our project today is the installation of the photovoltaic solar panel. It will keep the batteries charged for radio communications. Up until this time, batteries were removed and hauled out of each station on a regular basis, taken to a charging station hours away, recharged, and then returned to each station, a very long and tedious process. I am introduced to Mr. Paiboon , head of the wildlife sanctuary . He is helped to his feet by two other rangers. We shake hands. His leg is severely swollen and Surin tells me that someone will take him out today to the hospital for treatment. He was to have left earlier, but had waited for our arrival and wanted to be on hand for the solar installation. A white Toyota pickup is parked at the station ready to take him out. I am told that this one truck is the only 4wd running vehicle that belongs to the sanctuary all other trucks were parked dead due to the deficit in budget for the repair. “How is it possible to patrol this huge sanctuary with only one 4wd truck?” I wonder. “Each ranger patrols on foot” I am informed. Once the installation is completed, we say our goodbyes and head off up a steep incline towards the next station. We are on the road again and headed for yet another wildlife station on the Burmese border. We’re met by a smaller older gentleman with a patch over one eye who invites us in for tea. There is much talk and I ask Surin what he is saying. The river is small and very serene. However I am anxious to leave as I would rather not encounter the soldiers. The road is extremely rough and follows along the river for several miles and then heads off into the forest again. “This section of the road has been cleared and built by hand of the local people and you are the first American to ever enter this area.” Surin explains. It is necessary to have someone who knows the jungle as there are constantly things to be aware of. On the road ahead, Surin points out another danger that to the untrained eye goes unnoticed. There is a small stream crossing ahead, but the rutted path curves sharply to the left where it crosses the stream. I find it fascinating that there is no warning sign on this small road, actually no warning road signs at all in the wildlife sanctuary , but the road is not well traveled and is heavily regulated. Perhaps it is left unmarked for the unsuspecting poacher. As we wind our way through the forest, we see smoke and small fires inside the groves of bamboo. This is the largest variety I have seen with some up to 12” in diameter. The bamboo rubbing against each other in the wind creates heat and starts natural fires, which burn off the undergrowth and allow for new plant growth. Further along the path we come upon a group of villagers dressed in brightly colored clothing. They are walking to the next village, nearly 20 miles away for a funeral. It is an odd sight seeing these smiling faces in the middle of this remote jungle. Many of the elderly are grateful to see the truck and ask to climb aboard. The Toyota groans under the weight as 20 additional people climb on board wherever space is available. We arrive at the Delu (Suriya) wildlife protection station and the villagers climb off. Nok hands out food and they continue on their journey. Delu (Suriya) is an even further remote station and the antennae sections on board are unloaded. By evening the local rangers along with WFCC members have installed a 50 foot tower with guy wires, not a simple procedure and with virtually no equipment. Surin is concerned with safety as two of the rangers climb the triangular antennae sections to build the tower higher and attach the guy wires. The completed tower will become part of a central network that will keep rangers connected throughout the area. All of the equipment to include, radios, batteries, solar cells, wiring, antennae and GPS units have been donated by WFCC. Members not only train the rangers for installation of all the material but in the use of each component. It is nearly nightfall as we head out for the next station. We are headed into the savannah where the grass is nearly 10 feet high. I continue to hope that our “Truck with the Iron Heart” makes its way to the station with no breakdowns. We reach the station by 10pm and its pitch black other than the lights from our truck. We haven’t eaten. Tonight is my night for being the chef. Searching for food in the dark, we determine that the majority of our food was left at the last station by accident while the antennae sections were being unloaded. The truck is parked with headlights aimed at the entrance to the small block building where we will sleep. Our cooking burner mounted atop the LP bottle is lit and with a wok in place, I begin my preparation of our sumptuous midnight dinner. Food on hand, 2 cans of sardines packed in tomato sauce and pack of un-refrigerated hotdogs….yummmmmm. No one complains and as we complete our meal, a ranger approaches from out of the darkness. He informs us it is too dangerous to stay outside as the tigers are watching us. We are quick to go inside and I am assigned a small room with long windows. I make sure that my windows are latched tightly. In the other room Nok, Ko & Surin roll out sleeping bags onto the floor, the only protection from the outside are screens, as their room has no windows. I can only think of the 1996 movie The Ghost and the Darkness, with Michael Douglas & Val Kilmer. Based on a true story, a pair of man eating lions, attack a hospital nightly while tearing off sections of the roof to gain entrance. It is probably not the best thing to be thinking about at this time.….. but I am glad that my windows are secure. At breakfast the following morning I inquire about where the rangers were last night in the darkness. Without flashlights they must find their way around in the dark. I ask Surin to translate for me. Sometime there is little food for the rangers especially in the monsoon season when the track are naturally cut off and the whole wildlife sanctuary is cut apart from the outside world , no truck could come to deliver food to them so they must get fish and frogs just the reason of their survival only. One of the rangers has descended into a swampy looking area with a diving mask and small spear gun. He disappears under the bank we are standing on, hunting for large fish hiding back under the overhanging shelf. “The rangers are very brave.” Surin says proudly. Finishing my rice breakfast, I sit in silence, with total admiration for the sacrifices each ranger makes. Ko and I make repairs on one of the lockout hubs, reassemble it and we are ready to go. We are now out on the open savannah again and the grass is very dry and has been without rain for months. Up ahead is a large cloud of smoke and we approach cautiously. We are entering a black charred area that is still smoldering from an ongoing brushfire up ahead. The ground is nearly too hot to walk on and we get out to take a closer look. I can feel the ground heat through the soles of my boots and I am amazed as I watch Surin walk barefoot across the barren ground. He hasn’t worn shoes for years and his feet are like iron, impervious to nearly anything. Flames over 20 feet high lick at the grass and underbrush and when they reach certain types of trees, these trees torch like they were soaked in gasoline. The fire is in front of us and moving quickly. We have no choice but to drive straight through the flames. Our small two tire track path leads right through the wall of fire. Surin prefers to walk. We are first to go through and I can feel the heat as we drive quickly through the fast moving fire. My thoughts turn to the gas tank on the truck. I hope that the gasoline cans on board are closed tightly. Minutes later we see Surin running on the road behind us catching up on foot and climbing back into the truck. The flames are rapidly approaching but our truck moves quicker and soon the flames are out of sight. During the trip we have stopped several times for repairs and I pray that the “Truck with the Iron Heart’ will continue to run, especially this near the fire. On the road for nearly a week, I have seen only a small portion of what Thungyai holds. I hear Surin, Ko & Nok talking with rangers into the night. It makes me wish I could speak Thai, but then again just hearing the voices in this unfamiliar language somehow relaxes me. I ask questions when I need to, but for the most part I remain silent. I can feel the attention that WFCC members give each ranger and person we meet. I feel how much respect and admiration these people have in return for Surin and the other club members. Rangers, especially those with families, struggle to make ends meet. When Surin first started coming to the area, rangers were with torn out uniforms or boots. WFCC members donated and supplied the rangers with proper gear. Those who join WFCC go through a rigorous 2 year program of volunteer work, which includes many trips to the jungle. It is a great sacrifice for many of those who join, as all spare time is dedicated to helping the preserve without pay. The 2 year program is a test to see how dedicated one is before their honorable membership is granted. Construction projects for WFCC not only include the central radio project, but the building of wildlife checkpoints as well. Heavy laborious work of hauling materials in such as concrete, block and piping is part of the job. 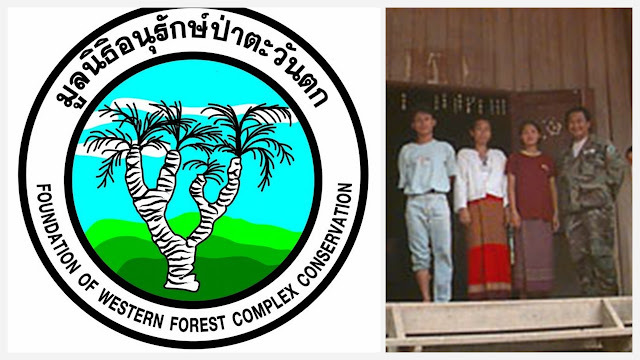 The small local Karen village population is also supported and WFCC holds retaining tribal cultural values as a top priority. I am excited at the opportunity to see something that very few will ever get to see. It is a several hour trip that will take us down miles of steep road into a large canyon. Not far into the trip, Surin shouts and we turn around to see a large animal off in the trees. It is a large Wild Boar. It immediately spots us and is off into the forest before I can take a picture. This is the most dangerous animal in the jungle, even more dangerous than the tiger. Traveling alone or in packs, they are very aggressive and will attack without warning. Surin explains that it is not easy to see wildlife in the jungle as there are usually two responses from animals once they spot you. Attack or run, and if caught on foot without protection, you hope it is the latter. We have a ranger with us this time and I am relieved he is carrying a pistol for protection as we are now in a very seldom traveled area. The road winds down the canyon dropping steeply. Ko has been our driver and has been trained by Surin. He is a careful and experienced driver. The road appears to have been built years ago and there are no signs of recent travel. Washouts are a constant problem and Ko carefully traverses each and every one. Near the bottom we pull into an open area and I am puzzled by the sight. A number of old abandoned metal buildings with concrete foundations are in total disarray and lay before us. There is no sign of life and it is obvious that nature is slowing reclaiming the small settlement. “What is the place?” I ask. Looking up, my eyes wander across the lush green jungle, steep hillsides and the tall rock face cliffs in the valley. It reminds me of Yosemite National Park in the U.S. and I am thankful that someone had the foresight to stop the Nam Choan Dam project. A short walk down below the abandon dam construction camp reveals a huge wild river flowing with crystal clear water. One glance into the water and I spot schools of fish everywhere. The day is hot and within minutes we are all swimming in the river. The current is strong and ahead I hear the roar of the falls and rapids below. We swim out to a large rock and jump off the rock into the pure water. I am indeed grateful for having seen this place during my life. The ride back out of the canyon is a slow one. Steam begins to flow from under the hood and once again the Toyota has to be stopped several times to cool off so we can add water to the leaking radiator. It seems to be getting worse and after inspection of the radiator hoses I am hoping we will make it. A slowly developing steering problem has also worsened climbing out of the canyon. On occasion the steering wheel turns and the front wheels do not respond. I know how dangerous it is, especially with this narrow winding road clinging to the hillside. I must have a look before the steering is gone. Luckily a member has donated a set of wrenches and I find the problem. A clamp around the steering shaft under the dash had loosened. Tightening the bolt takes care of the problem. At the top of the canyon, where the terrain begins to level out, the truck has overheated once again from the long climb out. Our water jugs are empty, so we must wait for the engine to cool down and hopefully make it to the ranger station. Surin suggests we walk the road now and later Ko will catch up after the engine cools off. Once again I am thankful that the ranger has his pistol after our earlier morning sighting of the Wild Boar nearby. The ranger has picked up several dropped orchids to return to Tikong wildlife protection stations. He has something to show us and we head over to edge of the canyon. He points to a large object hanging high in a tree nearly 50 yards away. I can’t make out what it is exactly, but it appears to be nearly 5’ tall and pagoda shaped. It almost appears to be a small house of some kind covered with small shake shingles. I walk closer to get a better view with my camera but I stop as Surin warns me to stay back. I back up slowly, my camera shot now seeming unimportant. Arriving back at the Tikong station, Surin points out the community garden that feeds many of the rangers. When possible, food is distributed to other rangers at nearby stations. A new shower and restroom facility, recently built by WFCC is nearing completion for the rangers and visitors. Up until now, no visitor restroom facilities have been available. Bees are swarming on the south side of the building where the rangers live. I keep my distance, but Surin assures me these are not the Tiger Head variety. A small trail leads out behind the station for about a ¼ of a mile. The ranger points up into a huge tree with a trunk diameter of nearly 12 feet. There are only branches near the top of this hundred foot high tree. He points to half a dozen hives hanging in the branches. Standing next to the tree, I point my camera upwards, moving around the tree for the best shot. Working my way around the opposite side of the massive trunk I am surprised by what I find. A narrow makeshift ladder made from bamboo disappears into the branches way above the ground. Short bamboo spikes have been driven into the tree trunk spaced about 18” apart. A punched vertical bamboo rail has been attached to the ends of each spike, creating a hand rail with a step wide enough for one foot. All of this work has been done by hand. Surin translates as the ranger tells the story of the bee tree. Nearby I spot one of the largest trees I have ever seen. The trunk at the base is as big a house and then it tapers slowly into a tall shaft. Logging in Thailand has been outlawed which has saved many of the remaining old growth forests. It is our final day and we must complete our journey to the sanctuary entrance and offices. During our last leg of the trip we have picked up two men who are walking out of the forest. Both have stomach problems and are sick. We have seen them walking for the last several days and when we make our stops, they keep walking, These villagers have walked over 70 miles with only a small knapsack and I marvel at their strength and tenacity. I wonder where and how they sleep at night. The last leg of the journey they are glad to be riding as the truck bounces along the bone jarring road. Near the sanctuary entrance and our final stop, we are greeted by more rangers. A small store with pre packaged foods is a welcome site. I gorge myself after having been on a nearly all rice diet for the last week. Surin shows me the aging Thungyai vehicle fleet parked behind the station. He points to an ancient Toyota Landcruiser that appears to have become part of the forest itself. This was the first vehicle to be driven into Thungyai. Covered with moss and lichen, there is no usable part in sight and it is slowly being reclaimed by the surrounding jungle. I suggest it be brought out and displayed somewhere as a museum piece near the entrance. The remaining vehicles have been scavenged for parts and they appear now as ready for the scrap yard. There is no funding to repair these trucks, keep them running or supply gasoline. I present my idea to Surin of donating modified Dodge M601’s for use here, but as he explains they are too large and require too much fuel to operate. The end of the journey is near. Outside the entrance gate to Thungyai, we stop for photographs, we are all smiling. I am grateful for my companions and for this life experience of great magnitude. I have been deeply moved by what I have experienced. Several miles from the entrance Surin painfully points to the barren roadside fields stripped of every ounce of vegetation. We are all tired and the ride home is an exceptionally long one. At midnight we make a slight detour to the railroad bridge across the Kwai Yai River. An old locomotive stands nearby. This is the famous site of the “Bridge over the River Kwai”. My thoughts turn inward and I cannot stop thinking of Thungyai. I had come to Thailand for Dodge Power Wagons and somehow ended up in a remote wildlife sanctuary. Did it just sort of happen or was it meant to be? Whose responsibility is it to take care of this great forest anyway? Yes, I understand it’s located in the country of Thailand, but doesn’t it really belong to the world? The work that Surin, the rangers and members of the Western Forest Conservation Club do is unfathomable and I know now that I must do my part in supporting these people who help one of the last great remaining forests in the world survive. Two years later at this writing, the central radio system project nears completion. More wildlife checkpoints have been set up including river stations to prevent further poaching. An ancient grove of Cycads, (the official tree on the badge of WFCC uniforms) has been found with living specimens over 1,000 years old! And yet there is more ongoing work and research to do in the years to come. If some of what I have written here has in some way touched you, than I hope you will consider doing your part by helping the Western Forest Conservation Club help the world. Every ounce of your donation will further their efforts to protect this world gem from further destruction. แต่อย่างน้อยต้องมีสักหนึ่งครั้งในชีวิตของเขาเหล่านั้น ในค่ำคืนที่ผูกเปลนอนอยู่ข้างห้วยท่ามกลางป่าลึกในยามรัตติกาลที่เงียบสงัดและเหน็บหนาวที่เขาเหล่านั้นต้องทุ่มเท อดทน ต่อสู้กับความเหนื่อยและยากลำบาก ในการเดินเท้าข้ามภูและสันเขามาตลอดทั้งวัน ที่คำถามแห่งชีวิตจะมาเคาะประตูอยู่ข้างหูเขาเหล่านั้น และวนเวียนอยู่ในมโนสำนึกเพื่อที่จะทดสอบความมุ่งมั่นในจิตใจเขาเหล่านั้นว่า "กูมาบ้าอยู่กลางป่า ทิ้งลูกเมียและภาระความรับผิดชอบในการมีชีวิตดังเช่นปัจเจกชนทั่วไปเพื่ออะไร.. รักษาป่าไม้และธรรมชาติตามคติอุดมการณ์ที่สืบสานกันมาเพื่ออะไร.. ทำไปแล้วได้อะไร ฯลฯ.."
ข้อคิดนี้ถูกเขียนขึ้นเพื่อยืนยันแก่ผู้ที่ยังเดินทางแสวงหาคำตอบแห่งคำถาม ของชีวิตนี้ ตลอดจนผู้ที่คิดและเข้าใจว่าชีวิตนี้ไม่มีความหมายอะไร และผู้ที่ท้อแท้สิ้นหวังทั้งหลายว่า นับแต่อดีตกาลนานมาตราบกระทั่งปัจจุบันมีผู้ที่ค้นหาและค้นพบความหมายแห่ง การมีชีวิตแล้วจำนวนมาก ซึ่งเขาเหล่านั้นต่างมีวิธีการเข้าถึงซึ่งนัยยะของความ หมายแห่งชีวิตด้วยมรรคาวิธีการที่แตกต่างกัน ซึ่งผู้ค้นพบและแจ้งแล้วในความหมายแห่งการมีชีวิตหลายเหล่านั้น ได้ยังประโยชน์แก่เพื่อนมนุษย์ร่วมสังคมโลกในการอุทิศตนทุ่มเททำงานตามที่ มุ่งหวังดังปรากฏเรื่องเล่ากล่าวขานและมีเรื่องบันทึกไว้ถึงผู้ที่อุทิศตนใน สาขาวิชาชีพต่างๆอยู่ทั่วไป ซึ่งมรรคาแห่งการใช้ชีวิตของผู้ที่ค้นพบคำตอบแห่งชีวิตเหล่านั้นย่อมแตกต่าง จากผู้ที่เกิดมาแล้ว มิเคยมีโอกาสได้ถามคำถามนี้แก่ตนเองเลยว่า "เกิดมาและมีชีวิตอยู่เพื่ออะไร"
My name is Nick Vujicic and I give God the Glory for how He has used my testimony to touch thousands of hearts around the world! I was born without limbs and doctors have no medical explanation for this birth. As you can imagine, I was faced with many challenges and obstacles. "Consider it pure joy, my Brothers, whenever you face trials of many kinds." ....To count our hurt, pain and struggle as nothing but pure joy? As my parents were Christians, and my Dad even a Pastor of our church, they knew that verse very well. However, on the morning of the 4th of December 1982 in Melbourne (Australia), the last two words on the minds of my parents was "Praise God!". Their firstborn son had been born without limbs! There were no warnings or time to prepare themselves for it. The doctors we shocked and had no answers at all! devastated. Everyone asked, "if God is a God of Love, then why would God let something this bad happen to not just anyone, but dedicated Christians?" My Dad thought I wouldn't survive for very long, but tests proved that I was a healthy baby boy just with a few limbs missing. Understandably, my parents had strong concern and evident fears of what kind of life I'd be able to lead. God provided them strength, wisdom and courage through those early years and soon after that I was old enough to go to school. one of the first disabled students to be integrated into a main-stream school. 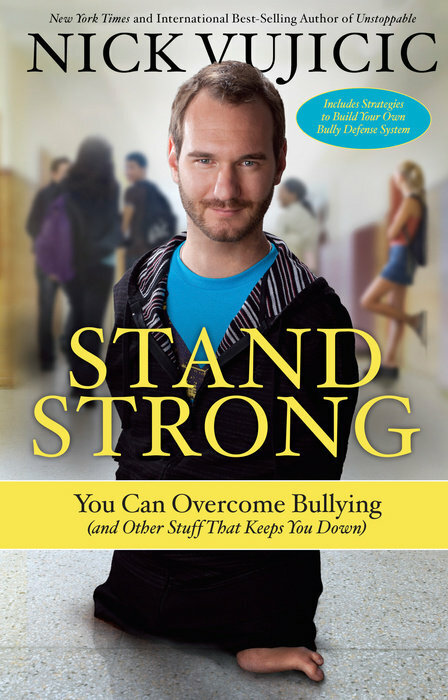 I liked going to school, and just try to live life like everyone else, but it was in my early years of school where I encountered uncomfortable times of feeling rejected, weird and bullied because of my physical difference. It was very hard for me to get used to, but with the support of my parents, I started to develop attitudes and values which helped me overcome these challenging times. I knew that I was different but on the inside I was just like everyone else. There were many times when I felt so low that I wouldn't go to school just so I didn't have to face all the negative attention. I was encouraged by my parents to ignore them and to try start making friends by just talking with some kids. Soon the students realized that I was just like them, and starting there God kept on blessing me with new friends. you. I understood that love to a point as a child, but I didn't understand that if God loved me why did He make me like this? Is it because I did something wrong? I thought I must have because out of all the kids at school, I'm the only weird one. I felt like I was a burden to those around me and the sooner I go, the better it'd be for everyone. I wanted to end my pain and end my life at a young age, but I am thankful once again, for my parents and family who were always there to comfort me and give me strength. Due to my emotional struggles I had experienced with bullying, self esteem and loneliness, God has implanted a pa ssion of sharing my story and experiences to help others cope with whatever challenge they have in their life and let God turn it into a blessing. To encourage and inspire others to live to their fullest potential and not let anything get in the way of accomplishing their hopes and dreams. One of the first lessons that I have learnt was not to take things for granted. "And we know that in all things God works for the best for those who love Him." That verse spoke to my heart and convicted me to the point where that I know that there is no such thing as luck, chance or coincidence that these "bad" things happen in our life. I had complete peace knowing that God won't let anything happen to us in our life unless He has a good purpose for it all. I completely gave my life to Christ at the age of fifteen after reading John 9. Jesus said that the reason the man was born blind was "so that the works of God may be revealed through Him." I truly believed that God would heal me so I could be a great testimony of His Awesome Power. Later on I was given the wisdom to understand that if we pray for something, if it's God's will, it'll happen in His time. If it's not God's will for it to happen, then I know that He has something better. I now see that Glory revealed as He is using me just the way I am and in ways others can't be used. I am now twenty-one years old and have completed a Bachelor of Commerce majoring in Financial Planning and Accounting. I am also a motivational speaker and love to go out and share my story and testimony wherever opportunities become available. I have developed talks to relate to and encourage students through topics that challenge today's teenagers. I am also a speaker in the corporate sector. I have a passion for reaching out to youth and keep myself available for whatever God wants me to do, and wherever He leads, I follow. I have many dreams and goals that I have set to achieve in my life. I want to become the best witness I can be of God's Love and Hope, to become an international inspirational speaker and be used as a vessel in both Christian and non-Christian venues. I want to become financially independent by the age of 25, through real estate investments, to modify a car for me to drive and to be interviewed and share my story on the "Oprah Winfrey Show"! Writing several best-selling books has been one of my dreams and I hope to finish writing my first by the end of the year. It will be c alled "No Arms, No Legs, No Worries!" I believe that if you have the desire and passion to do something, and if it's God's will, you will achieve it in good time. As humans, we continually put limits on ourselves for no reason at all! What's worse is putting limits on God who can do all things. We put God in a "box". The awesome thing about the Power of God, is that if we want to do something for God, instead of focusing on our capability, concentrate on our availability for we know that it is God through us and we can't do anything without Him. Once we make ourselves available for God's work, guess whose capabilities we rely on? God's!